NOVEMBER 2018 THE SHOP 117 Miller Electric Mfg. Co.'s educational support program. Eventually four tracks will be devel- oped and each program will be a two-year pathway. Adult programs were due to begin this fall, with student programs beginning early in January 2019. The cost has yet to be determined but scholarships will be available as a result of the Saralee Baldwin and Petersen endowments. Only 12 to 15 students will participate in each course, enabling hands-on, focused instruction. 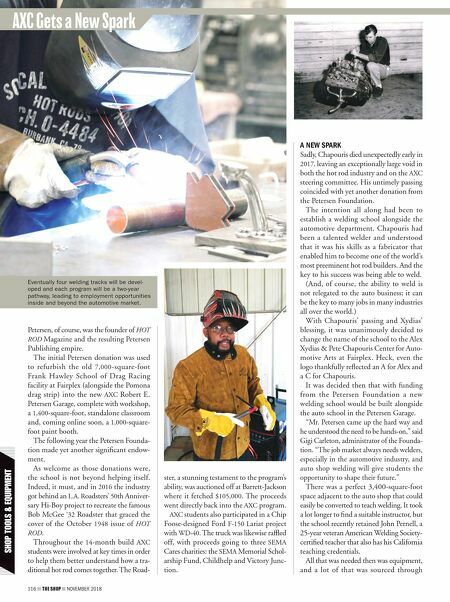 As Pernell was quick to point out, "Stu- dents who do the welding course and com- bine it with CTEC's water distribution/ operation course, for example, are almost guaranteed a job at the end." And that's what AXC is all about—edu- cating young people about opportunities and giving them the skills, tools and con- fidence to take advantage of them. Xydias gets the final word. "Having AXC bear my name is an honor and now to have my friend Pete Chapouris honored alongside me is a dream come true. 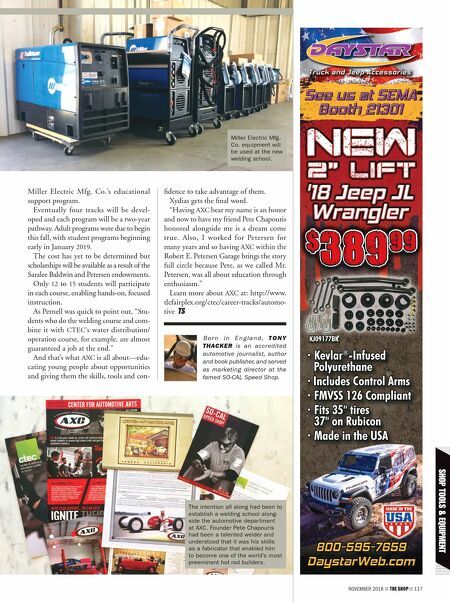 Also, I worked for Petersen for many years and so having AXC within the Robert E. Petersen Garage brings the story full circle because Pete, as we called Mr. Petersen, was all about education through enthusiasm." Learn more about AXC at: http://www. tlcfairplex.org/ctec/career-tracks/automo- tive B o r n i n E n g l a n d , TO N Y THACKER is an accredited automotive journalist, author and book publisher, and served as marketing director at the famed SO-CAL Speed Shop. Miller Electric Mfg. Co. equipment will be used at the new welding school. 800-595-7659 DaystarWeb.com · Kevlar ® -Infused Polyurethane · Includes Control Arms · FMVSS 126 Compliant · Fits 35" tires 37" on Rubicon · · Made in the USA KJ09177BK $ 389 99 '18 Jeep JL Wrangler 2" LIFT NEW See us at SEMA Booth 21301 The intention all along had been to establish a welding school along- side the automotive department at AXC. Founder Pete Chapouris had been a talented welder and understood that it was his skills as a fabricator that enabled him to become one of the world's most preeminent hot rod builders.